I feel like this guy is hard to rate. In a deck with lots of combat icons and Toughness, he's 1 star. In a deck that lacks combat icons and Toughness, he's 5 stars. 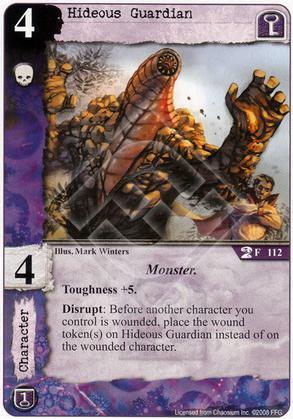 I have Hideous Guardian in my Silver Key deck, which is full of characters with "exhaust to" abilities. Such characters usually play a support role and are not strong at stories. In fact, there's not a combat icon nor a point of Toughness among them in my deck. Enter Hideous Guardian, and suddenly all my chumps are basically invulnerable for the next six wounds. The Guardian is the perfect complement to a finesse/control build that doesn't want to mix it up, but rather be evasive, at stories.